I attended a fantastic event held at Westminster on March 5th by Care International, the Fawcett Society and the Centenary Action Group (CAG). This Day of Action to end workplace harassment was the latest campaign to promote workplace safety, equality and justice for women. The CAG campaign hashtag ‘#this is not working’ is timely not just because it was launched around International Women’s Day on March 8th but also because we are approaching a hugely important decision by the International Labour Organisation (ILO) – the UN agency responsible for labour standards. Last summer, the ILO agreed to consider proposals for a legally-binding convention to protect women from workplace harassment. During the next ILO negotiations in June 2019, Care International and other campaign groups are calling for the adoption of the strongest possible version of this convention supplemented by a recommendation. Only then can this new global law protect the world’s poorest and most vulnerable women. Worldwide more than one-third of nations have no laws prohibiting workplace harassment. This year, the UK government has two key opportunities to improve working conditions for women. The government has the chance to improve the UK’s current laws on workplace harassment. And together with employers’ organisations and trade unions they can support a strong ILO convention. To endorse and call for legislation to cover all women in the workplace – to be defined by the needs of the workers not just the employers. To reinstate UK third-party harassment laws, which affect women in the retail, hospitality and other sectors who may face harassment from clients and customers and other third parties and who are currently not protected by laws covering their employer. On March 5th the day began with a room full of amazing women from parliament and elsewhere. A few of us proudly sat wearing our 50:50 T shirts. Helen Pankhurst was the first speaker and shared with us some of the stark statistics around workplace inequality: that 46% of women experience workplace harassment and that women from a BAME background suffer 40% higher incidents. Worldwide more than one-third of nations have no laws prohibiting workplace harassment. We heard from the wonderful and motivational Jess Phillips MP, from Maria Miller MP and perhaps most importantly from a lady who had been a domestic worker in appalling situations and who now speaks internationally on the need to safeguard women. We received some hugely helpful training from CARE international on how to push for this conversation to be heard and amplified in the workplace, and on how to lobby for political change. The need for a gender balanced parliament is inescapable when facing an issue such as this. We all know women should be leading such conversations and calls for action and yet we also know how under represented we still are, even in the UK. 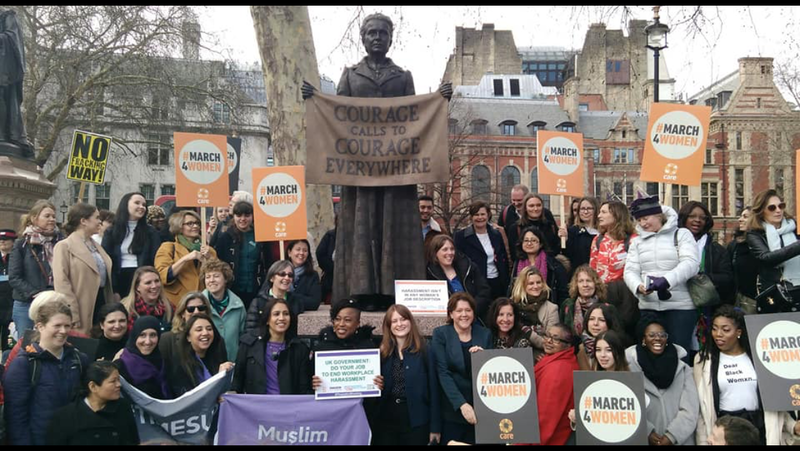 Suitably fired up we congregated and then marched together to the statue of Millicent Fawcett in Parliament Square to take photos, speak to the media and to symbolically stand in front of parliament calling for change. The day concluded with many of us meeting personally with our MPs to talk about all we had learned and the importance of their support for this campaign. We are asking all MPs to publicly pledge to end workplace harassment in 2019, and to keep pressure up on government. The day was such a fantastic experience and again a wonderful example of the power of women collectively calling for equality and change. A huge thank you to all involved in creating such a dynamic and motivational day and I very much hope that we will soon see much needed progress for women everywhere.